As some of you already know, we just returned from a 7-day cruise to the Bahamas. 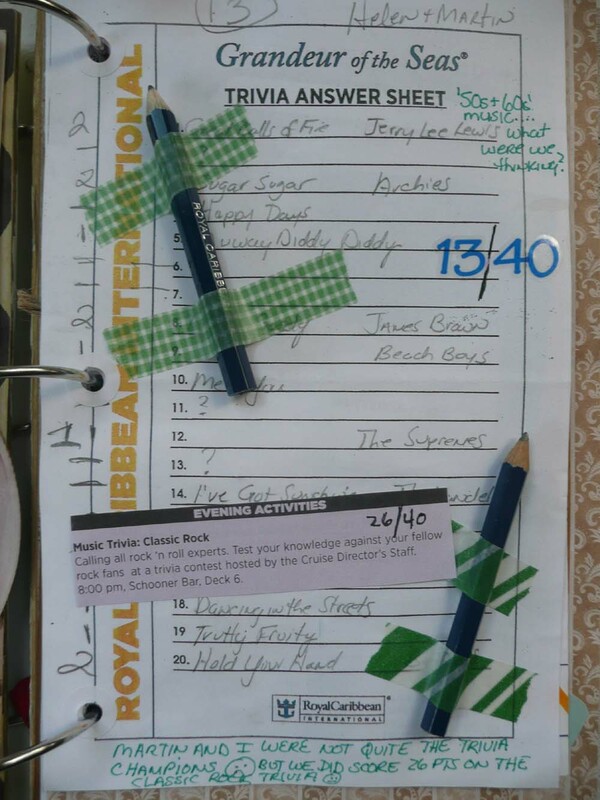 We had a lovely time and Royal Caribbean really knows how to keep people busy and entertained. I actually need a vacation from my vacation because I did so much! 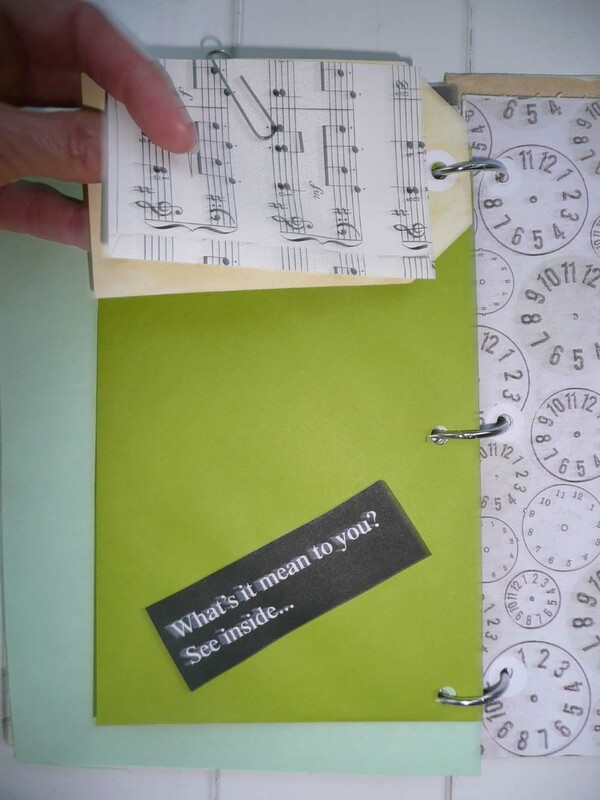 A while ago I wrote a blog post about making a smash book. I believe it was call “Get Smashed” or something like that. 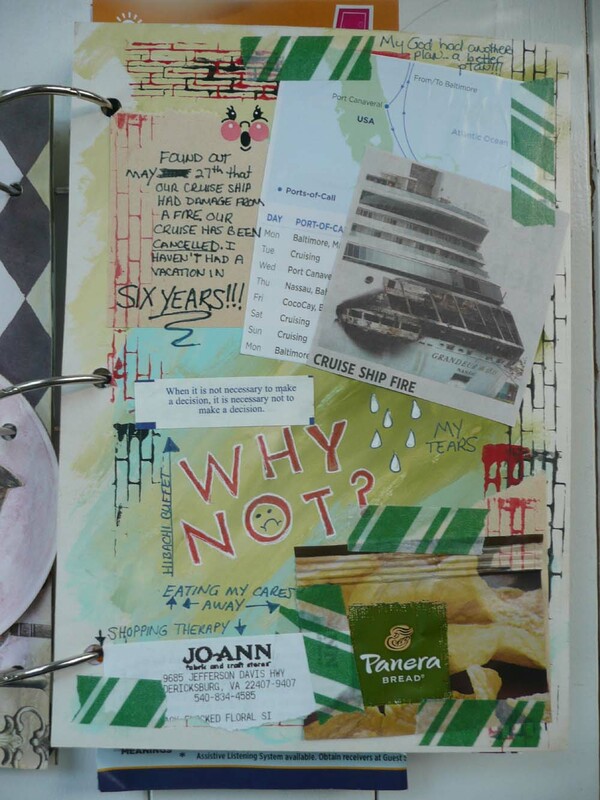 Anyway, I took my homemade smash book on the cruise AND I actually worked on it. I didn’t get everything in it on the cruise though, so I have worked on it a little at home too. 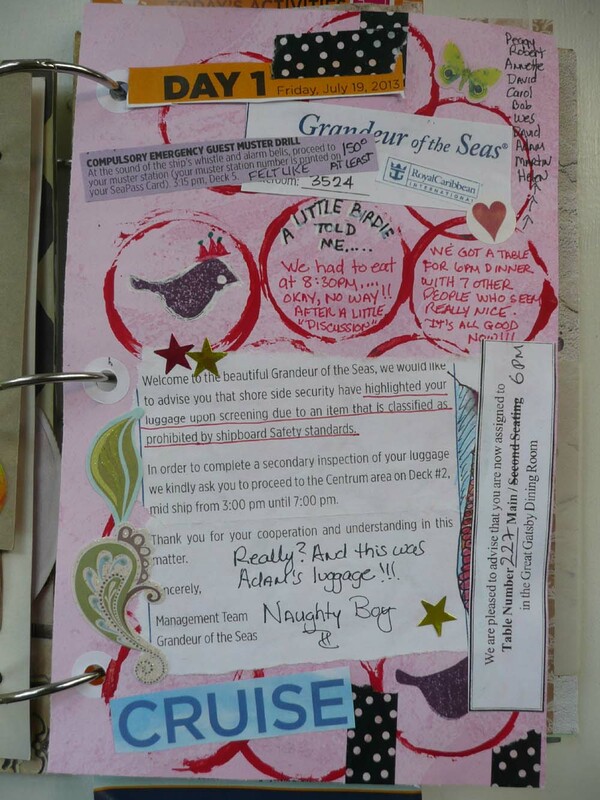 Here are pictures of some of my cruise pages, and don’t worry, there are no family photos involved! As you can see, our original cruise date was pushed back. 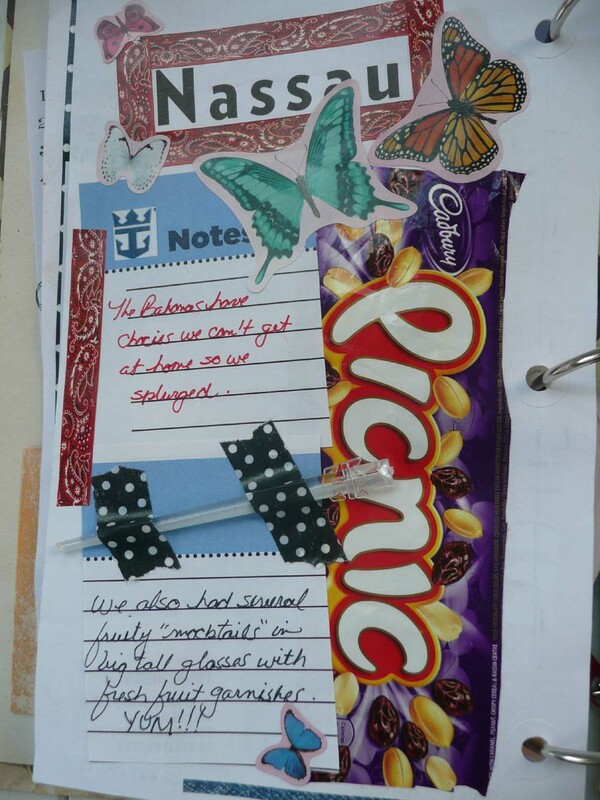 Some of the first paper “stuff” we got on the cruise. The airboat ride was really fun as were all our shore excursions. Yeah, you can read it right there, I only worked out three of seven days on the cruise. I paid for it at the gym this morning though! Not working out did NOT stop me from eating lots of food and drinking fruity “mocktails”. The trivia games were fun, but Martin and I were horrible at it. Only 13 out of 40 right on the ’50s and ’60’s rock game and 26 out of 40 on the classic rock game. In our defense though, we only had little 2 or 3 second snipettes from obscure parts of the songs. Nothing really “smashed” here. 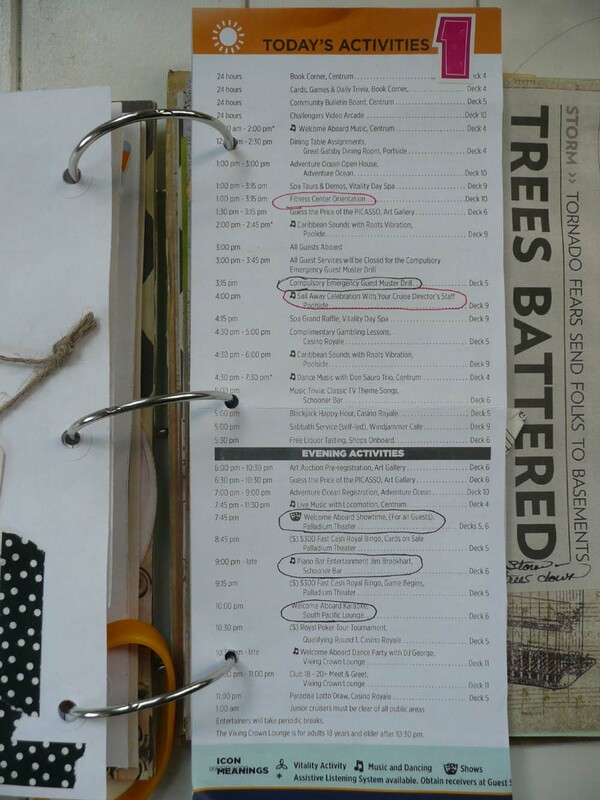 I took the daily activities schedules, folded them in half (so they fit in the book) and punched holes in them. I put number stickers on the top of each day. Oh and see the yellow rubber bracelet on the right side? That was flung into the crowd by the cruise activities staff during the 70’s Line Dance Party! I had forgotten all about the Hustle!!! Well the summer is half over folks, but that still gives you plenty of time to go out and have some adventures of your own. Just remember to keep everything you get so you can have a “smashing” time too! I recently came across and idea (the idea is not new, only new to me) that I think is really appealing and fun. 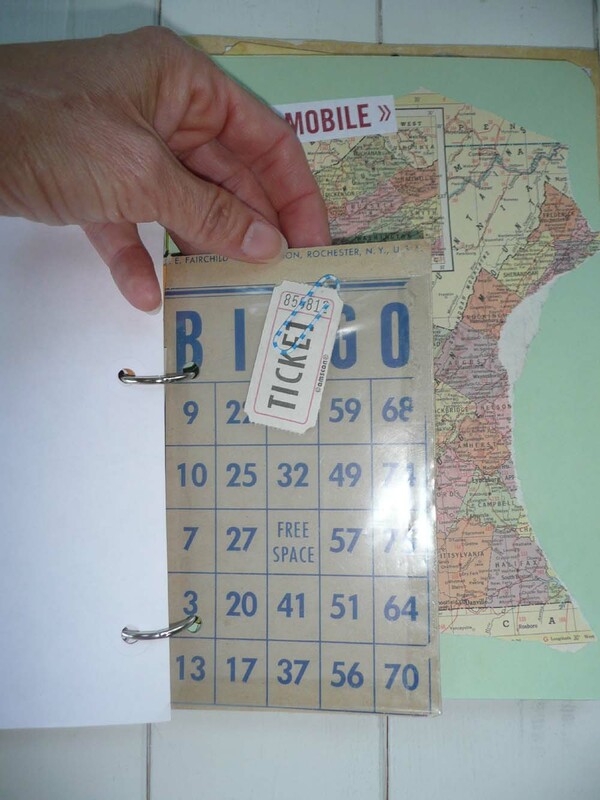 It has to do with archiving things like ticket stubs, play bills, receipts, cool graphics and other interesting ephemera (this is a 5 cent word for paper items). What I’m talking about are Smash Books. 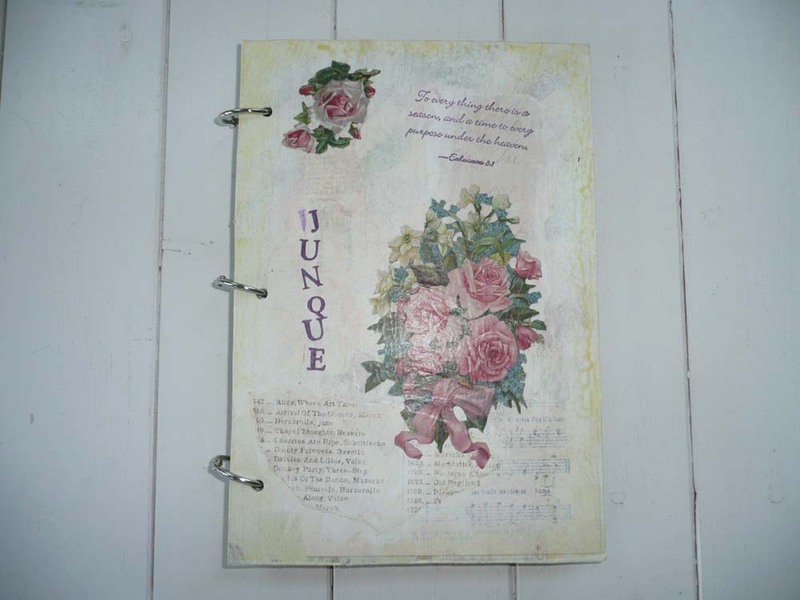 These are not scrapbooks or journals as we know them. 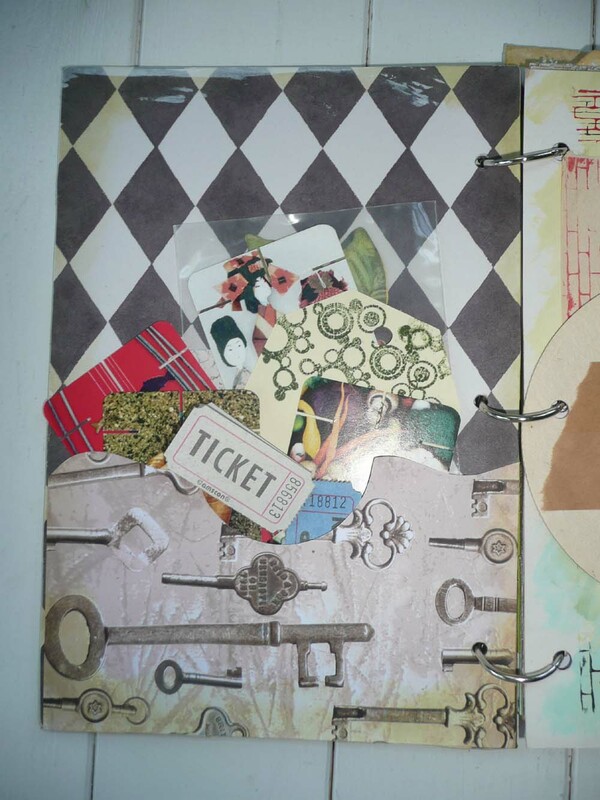 This is more like a place to store the little oddities you don’t usually include in scrapbooks. 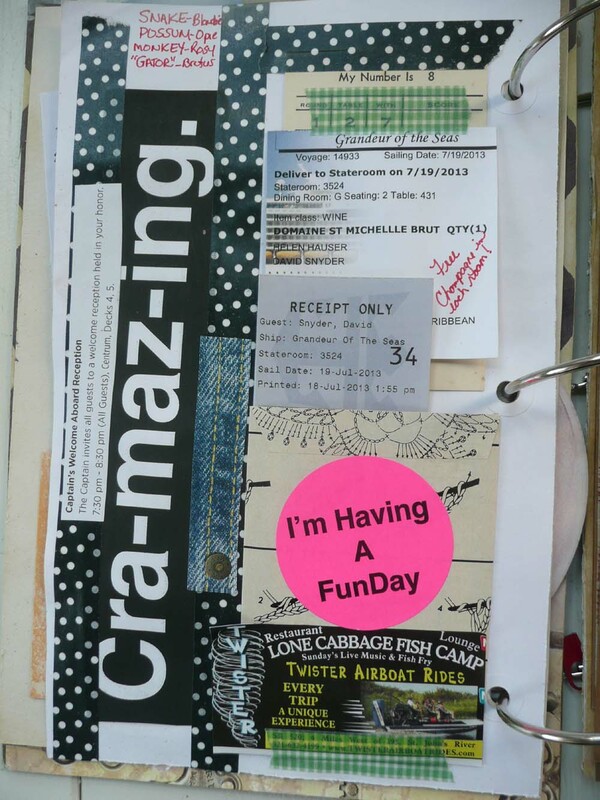 Most smash books have little journal passages, doodles and other artwork added among the “smashed” (glued or taped) ephemera. 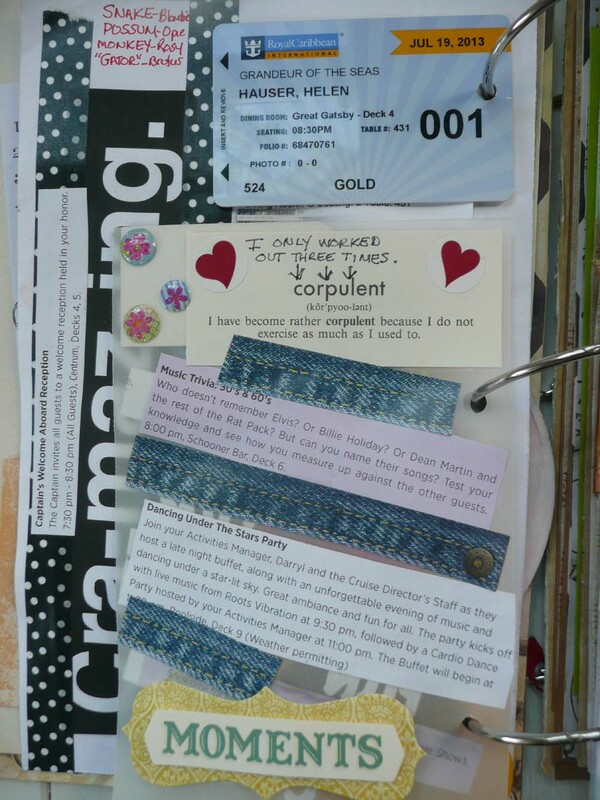 There are many smash books available for sale in craft shops and through websites. I, however, wanted to make my own. After watching what seems like thousands of “How to Make Your Own Smash Book” videos on YouTube, I started creating my own. What appeals to me most about smash books are the envelopes, flaps, tags and hidden spots they have for storing your junk treasures. Here are some pictures of my smash book. Please keep in mind that this is only the book itself and I have not “smashed” any bits into it yet! 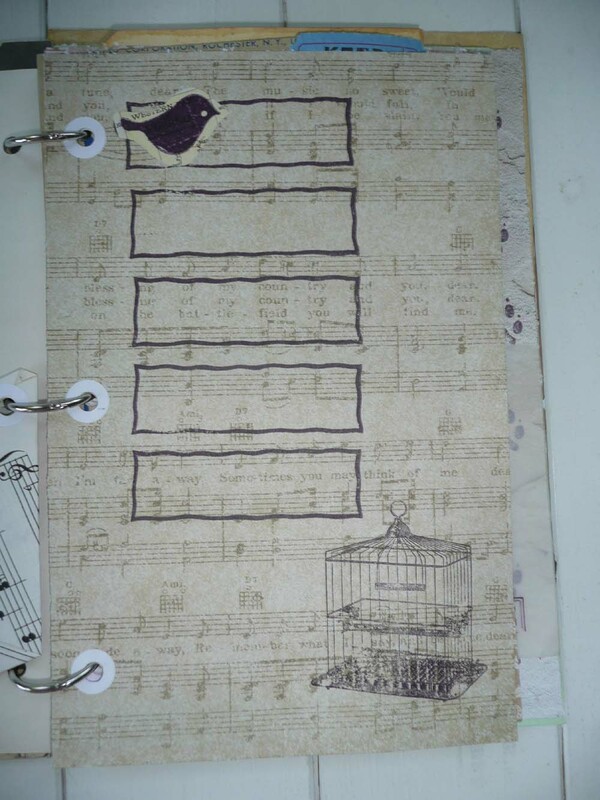 Page stamped with boxes ready for quickie journaling. Bingo card with clear enveloped attached to stuff bits into. Also paper clip to attach stuff outside. 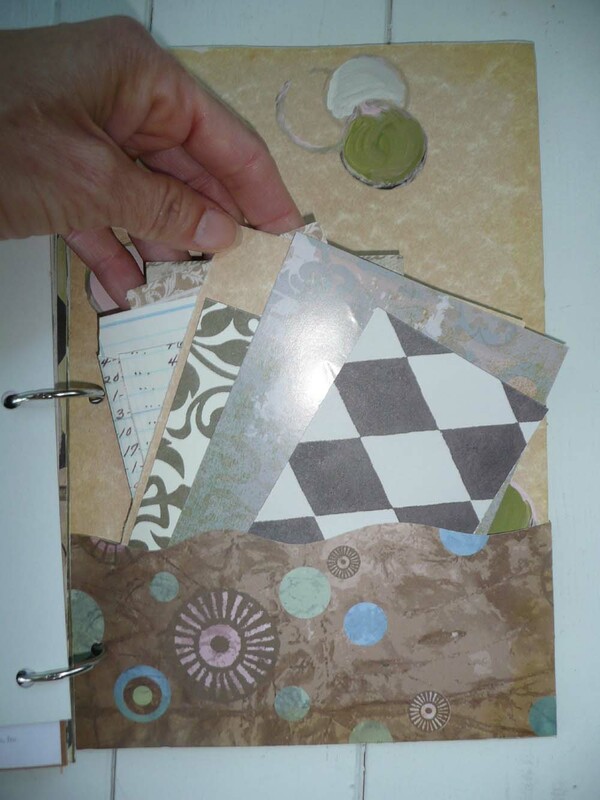 Page with a pocket made from a game card washi taped to the paper. 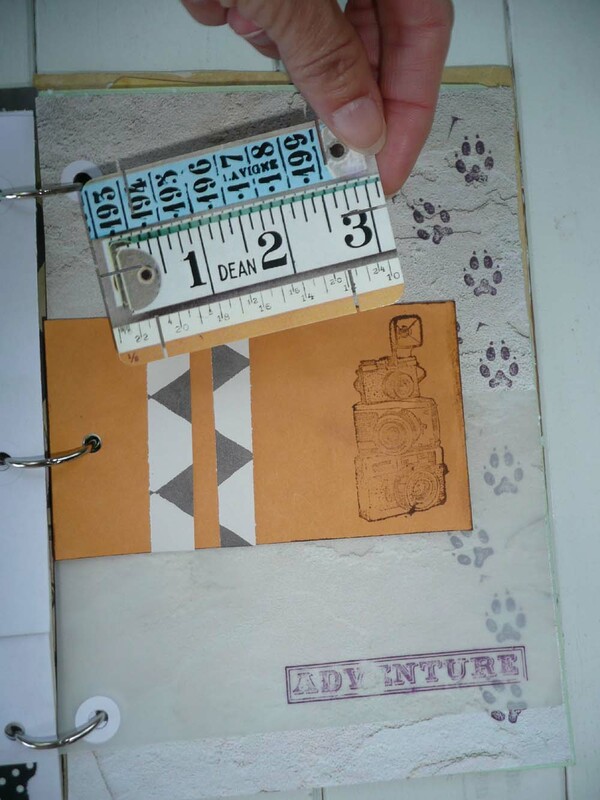 A blank tag slips into pocket and can be journaled on or covered with ephemera. 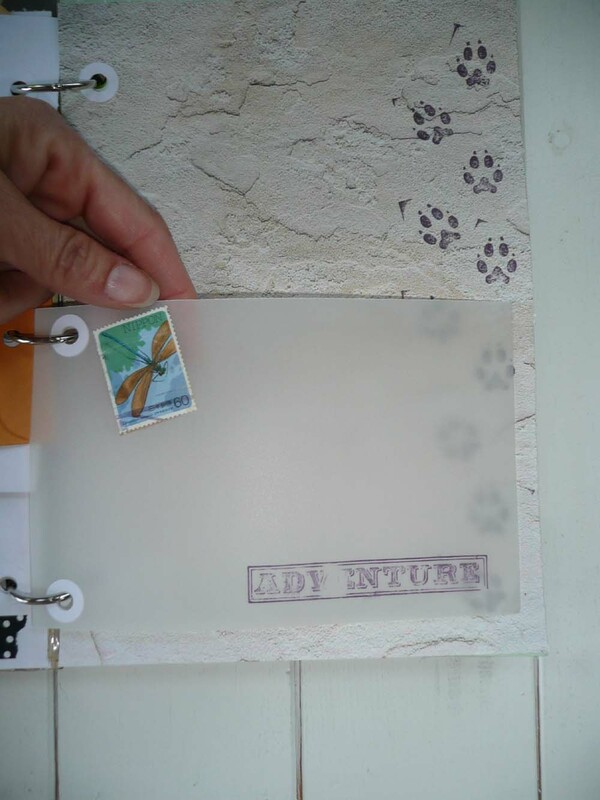 Vintage green envelope to fill with treasures. 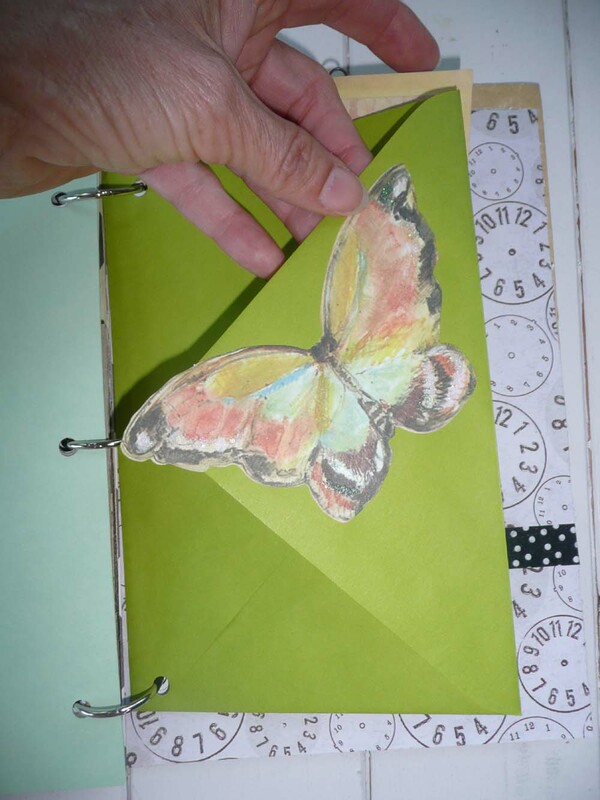 A butterfly cutout makes it pretty. Back of the envelope with text from an insurance ad attached. Also another tag. 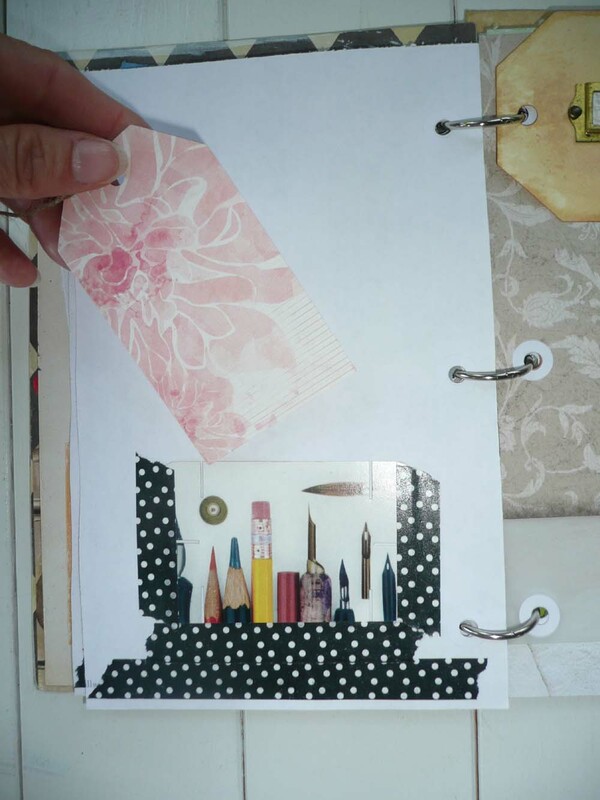 This one also has a small envelope pinned to it for more storage. 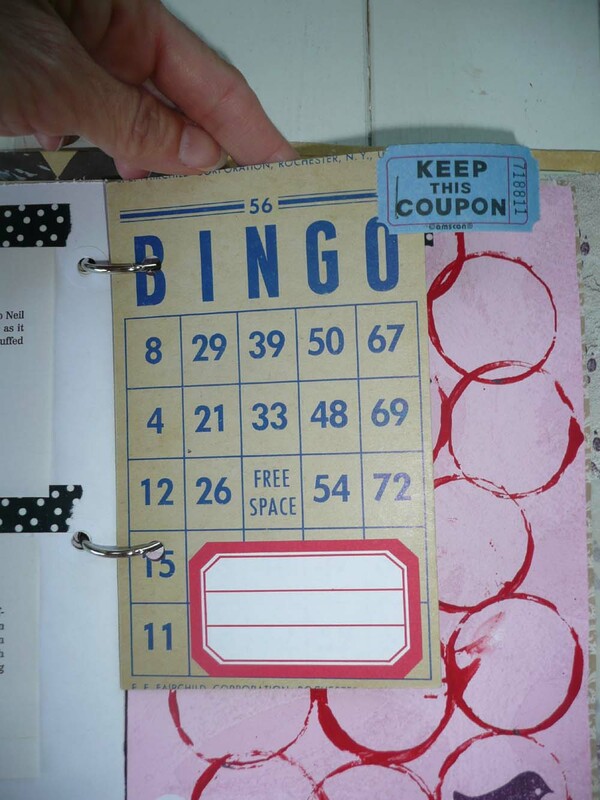 A bingo card with file tag adhered for quickie journaling. A piece of vellum that has been stamped two ways! A manilla envelope that has been aged and stamped. The two paper bands hold the game card in place. I can glue stuff to the back of the game card and store stuff in the envelope. 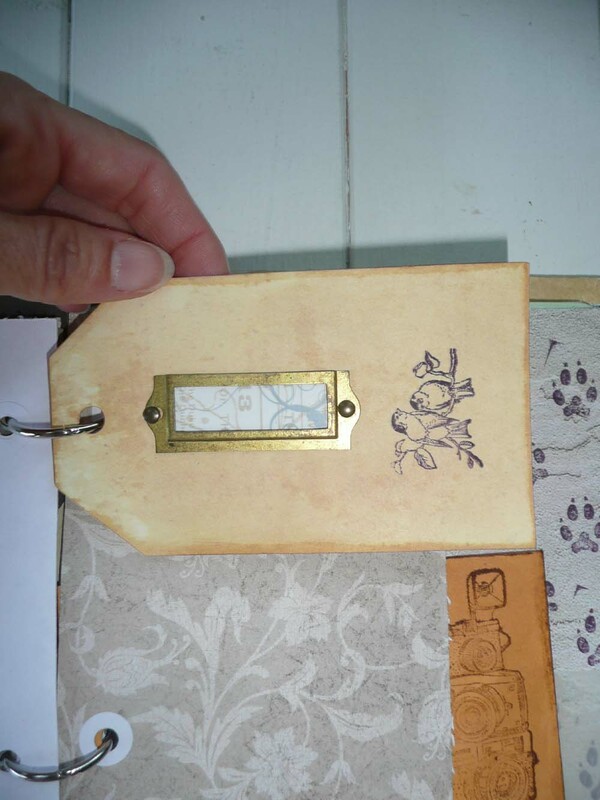 An aged manilla tag that has a metal file drawer tag. 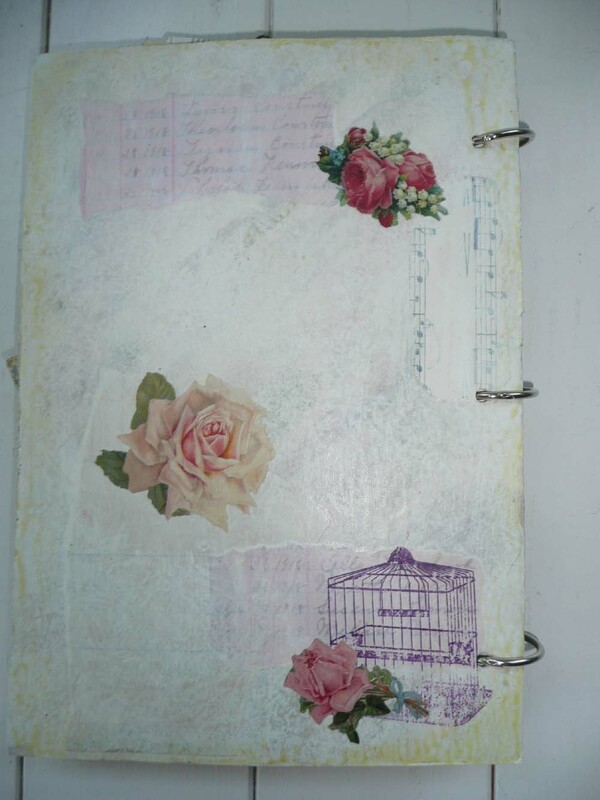 The paper in the metal can be taken out and journaled on the other side. Inside of back cover has a pocket to hold more goodies to use for “smashing’. 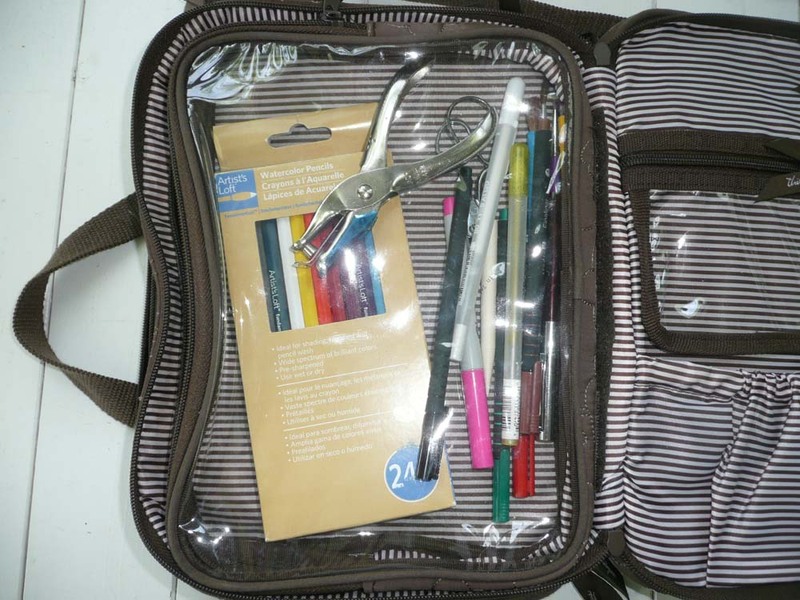 Various pens, water color pencils, hole punch, small scissors and other tools to use for “smashing”. 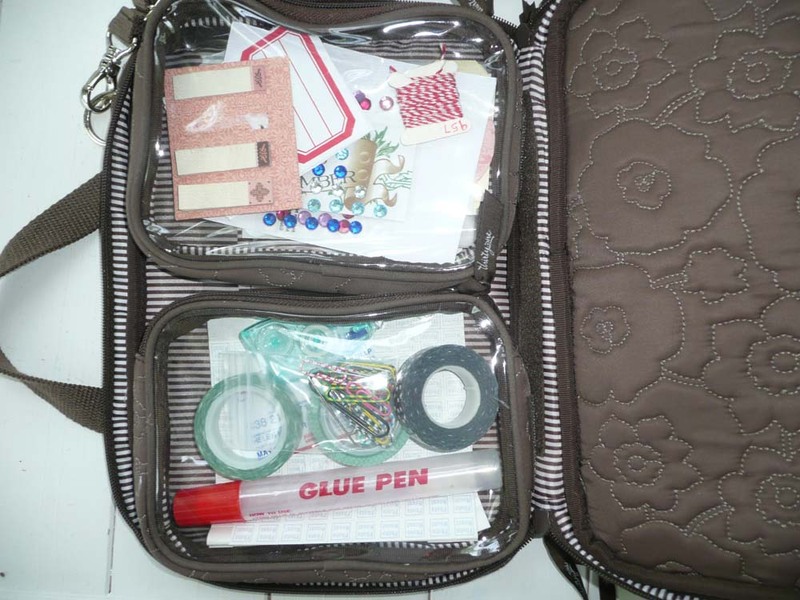 Glue stick, washi tapes, paper clips, etc. for adhering stuff into the book. Also more paper bits to make my “smashing’ more interesting. Again, keep in mind that this is the book only. I have not added my ephemera yet. 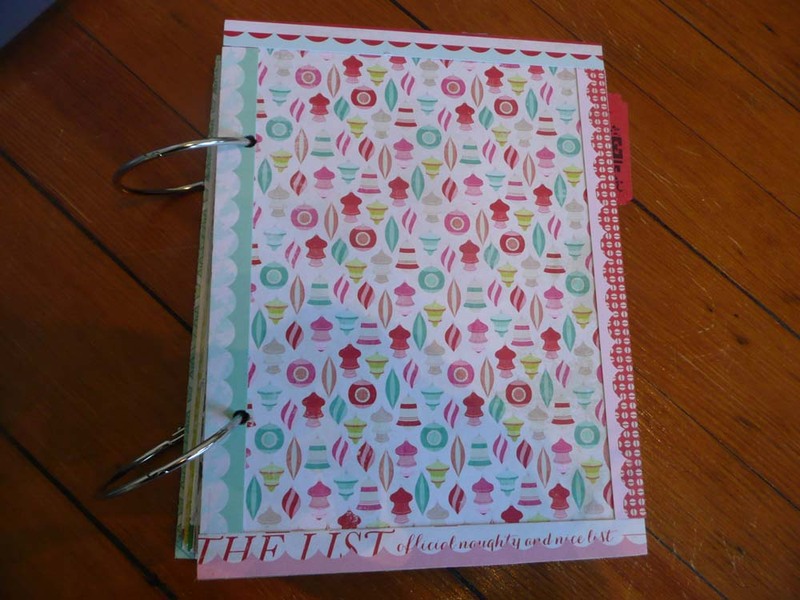 I hope to fill it up with things I collect this summer. I will post some “smashed” pages when I get them done. If you are interested in starting your own smash book or still don’t understand the concept, check out the multitude of videos on YouTube. I wish all of you, my dear readers, a “smashing” summer!